Our kids classes are designed for kids to practice kitchen skills, learn about kitchen equipment, and include food and personal safety. The kid friendly recipes are chosen so that the kids can do them themselves once they get home. They get to eat or take home their own creations. Fostering independence is a main goal, as is having fun. Kids Cook! classes are open to the public and are held at several local venues including Little Rock Montessori School, Pulaski Academy, Episcopal Collegiate School and Wildwood Park for the Arts. 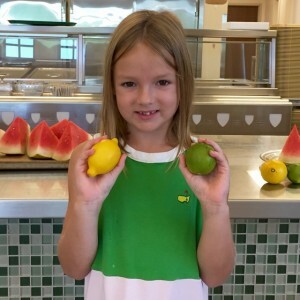 Current classes are listed on the Class Schedule page or find Kids Cook! on Facebook. SPORK is a nutrition-based, hands-on cooking program for middle school kids and their families. Kids Cook!™ collaborated with a Clinton School of Public Service graduate student team, Pulaski County Youth Services and Arkansas Children’s Hospital to develop the cooking program which includes nutrition sessions for parents and a family meal made entirely by the kids. Now in its ninth year, the program has been delivered 56 times in nineteen Central Arkansas schools, after school programs and libraries and has reached over 650 kids and their families. In 2019 SPORK will be held at Arkansas Children’s Hospital and at Our House in Little Rock. For specific information on how to bring SPORK! to your school or organization, please contact us. Kids Cookin’ for a Cause! Our Kids Cookin’ for a Cause! community service program gives kids the opportunity to practice their kitchen skills while earning community service hours. Kids bake or cook and the food produced is donated to Potluck Food Rescue, Arkansas’ food rescue organization, for kids served by Potluck’s Kids Pantry. Since Nov 2008, over 950 kids, ranging from Kindergarten to 12th grade from 15 schools, churches and community organizations have participated in this project. They have produced an estimated 11,750 pounds of food, enough for over 18,000 meals for hungry kids. Potluck serves community food programs throughout central Arkansas and the state including: children’s programs, women’s emergency shelters, soup kitchens, homeless shelters, organizations serving displaced veterans and Hispanic families, senior day centers and food pantries. To learn more about this program and how you can bring it to your group or school, please contact us.